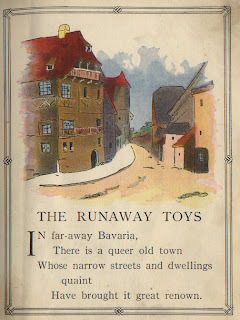 This cute little book was published in 1933 by Rand McNally and was written and illustrated by Lillian Baker Sturges. 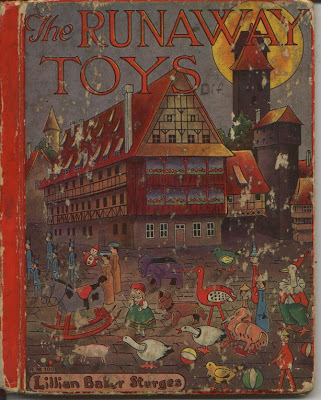 The story takes place in Bavaria, where all the toys are made for children around the world. Only problem is, there are no toys left for the Bavarian children. 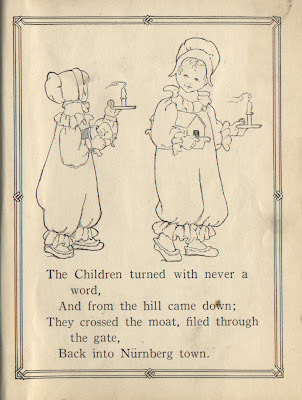 It's told in rhyme and illustrated variously in color and black and white. I've trimmed the story down a little, but you'll get the gist. In far-away Bavaria, there is a queer old town whose narrow streets and dwellings quaint, have brought it great renown. A high stone wall surrounds the place, a hundred towers rise, and many a tower once rose high that now in ruin lies. Oh what a rainbow colored town!--You'd surely like to stop and look in through the window panes to see this fine Toy Shop. For Nuremberg, as well you know, is noted for its Toys; they're sent the wide, wide world around to please the Girls and Boys. Alas! they are all sent away to far-off foreign lands; the little ones of Nuremberg must play with empty hands. Here are many lovely dolls with flowing curly locks, some clad in common calico, and some in silken frocks. There're dolls of wood, and dolls of rags, and dolls that really walk, and dolls that jump, and dolls that sleep, and dolls that truly talk. 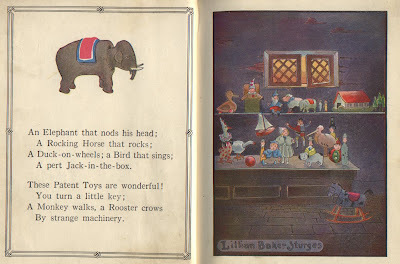 An elephant that nods his head; a rocking horse that rocks; a duck-on-wheels; a bird that sings; a pert jack-in-the-box. These patent toys are wonderful! You turn a little key; a monkey walks, a rooster crows by strange machinery. Once upon a time the shopman, Hans, old, and forgetful quite, wide open left the toy shop door and went home for the night. Leaving the toys unguarded there, it presently grew dark, and then arose a murmuring up near the Noah's Ark. "I'm sure I'm tired of staying here," exclaimed the Jumping Jack; "I'd like to jump and limber up this stiffness in my back. The other jacks are happier far who've gone to foreign shores, for they know something of the world and dwell in lovely stores." "I'd like just once to see the moon, it is my fondest dream to gaze upon a real, true moon, not just a stray moonbeam." Thus spoke the pretty waxen doll, and then she heaved a sigh; "we'll never see the moon from here," Was Noah's sad reply. into the great big glorious world, and oh, the sights I'd see! Yes, sights both new and wonderful; won't someone please wind me?" "Ah, here's the key and there's the lock right underneath your wing' of all the animals in the shop you are the queerest thing!" 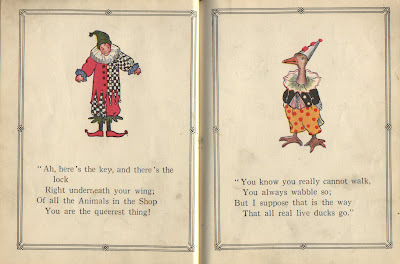 "You know you really cannot walk, you always wabble so; but I suppose that is the way that all real live ducks go." The rubber balls cried: "We can bounce," and bounced down to the floor; they bounced and bounced and bounced again, and bounced right out the door. Good Mrs. Noah followed next, the animals two by two, the rocking horse, the lamb-on-wheels, the squad of soldiers too. Out the door into the street, the gay procession went, with jostle, tumble, rush and bang--on sight-seeing intent. The children, they were fast asleep--such chubby girls and boys! When down the silent moonlit street marched on the troops of toys. 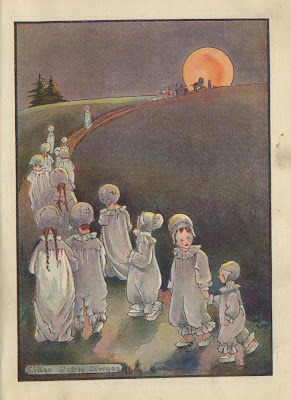 From underneath the coverlets stirs many a little head; the children soon are wide awake and bounding out of bed. One glimpse from windows open wide--the toys in moonlight glow; they flash and gleam with color bright as they pass on below. Down many a winding flight of stairs, all stealthily and fleet, came echoing through the hallways dark the patter of little feet. 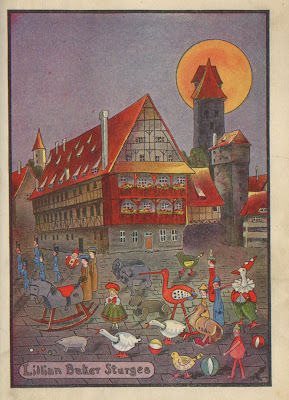 Never before was such a sight in quaint old Nurnberg town--each little one tripped blithely out in white nightcap and gown. The toys marched on with never a glance at the children trooping out, they did not even seem to hear their joyous laugh and shout. But still they followed up the toys farther and farther still, until they spied the yellow moon just resting on the hill. Each mother to her child's room went to see if all was well; but every bed stood empty--what a shocking thing to tell! They searched outside the old town gates; Look! over the hill they saw the train just vanishing--a sight to make them ill.
Across the dale and up the hill, breathless, yet striding fast, they chased the truant little ones and caught them too, at last. "Come back, and we will give you toys," desperate the Mothers cried: "We'll give you toys and toys and toys, until you're satisfied." The children turned with never a word, and from the hill came down; they crossed the moat, filed through the gate, back into Nurnberg town. They went contentedly to bed each with a woolly toy, a doll, a nodding elephant, an ark, or sailor boy. But not a truant toy came back that started forth to roam; maybe you'll find some if you look, right here, in your own home!